http://www.Swordguitars.com/ - offers custom build and refretting services for any tuning. http://www.freenotemusic.com/ - offers G&L's and strats in 19-tone, and 12-tone Ultra plus just intonation (as far as I know) but have good reviews. If anyone else knows of a manufacturer post here. True Temperament Fretting Systems, Sweden. Guitars, guitar and bass necks, with wavy frets for 2 different Well Temperaments. The Victoria 48F by Atlansia. 24EDO 4 string bass guitar. 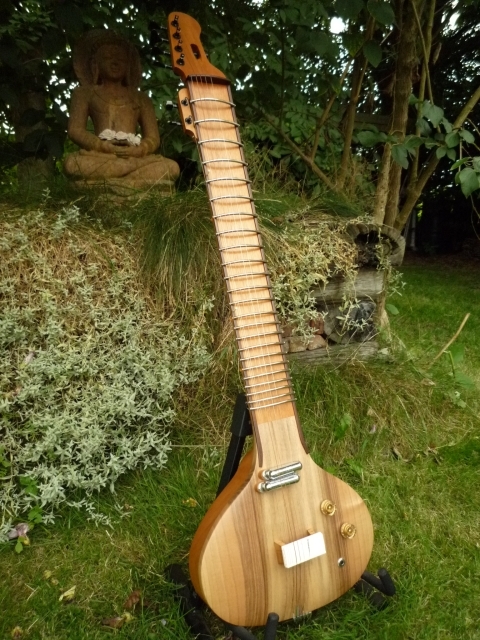 'Fusion Sitar' electric hybrid guitar / sitar. Available through various distributors. The frets are tied on and can be moved to any position, if the position coincides with a sympathetic string tuner the tying filament can be split to either side of the tuner post. Solidbody electric Saz with tied movable frets. Semiacoustic and solidbody electric sitars with tied movable frets. I have a freenote 19-EDO strat. It's great fretwork, especially for the money. Oni Guitars, in Austalia, can make pretty much any extended range, tuning, ... anything. I know the owner plays fretless, but I've discussed 19-EDO and 24-EDO projects with him. My Oni eight string is 12-EDO with some partial fretwork in 24-EDO. The family shop of Zeynel Abidin in Istanbul. "51" in length. It has nylon frets tied to the neck and 3 courses of 2 strings each. Tuned D A d. The Cumbus is a relatively young instrument. It was developed in Istanbul in the early 1900's. The inventor, Zeynel became known as Zeynel Abidin Bey. The famous Ataturk Mustafa Kemal, Turkey's first president, dubbed it Cumbus, pronounced joom-bush. Cumbus is Turkish for revelry, just the mood this instrument inspires. Our Cumbus are imported from the Family shop of Zeynel Abidin on Ataturk Bulvar in Istanbul." An affordable instrument. I count 55 movable frets. The scale looks to be longer than a bass guitar with the advantages of more precise tuning of frets and larger gaps between them. It would be interesting to replace the skin with a wooden body and mount a pickup. Have any of you plugged in, and played a G.Rosul? I'm a little wary after my first attempt at buying an e/sitar. bizarre looking things. have you read up on the 22 shrutis yet KJ ?? fascinating stuff. Clarence Barlow explained to me once how 22 tone could be generated by a dominant chord - or something of that nature. Interesting and animated fellow. Vielen Dank, gefÃ¤llt mir geil, diese Demos! Sieht sich aus als stimmt ein schÃ¶ne Instrument.